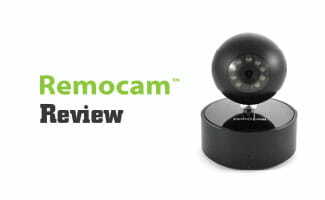 Remocam Reviews: The First IoT Camera? Even though Remocam has only been on the security scene for about two years, it’s an impressive little Wi-Fi camera that bests the Nest Cam in features and functionality. And although we do always recommend professionally monitored systems, Remocam offers security basics that can help you feel a little safer like 2-way voice, motion-sensing image capture, and a 335°+ view. Retailing at $200, we think this camera is a good investment, especially when you compare the features alongside other similarly priced Wi-Fi cameras. It’s a must for dog lovers, and we can’t wait to test the other smart devices Remocam has lined up. Remocam is an impressive Wi-Fi security camera with all the core functionality we'd look for in an unmonitored camera, but it fell a little flat on its promise of home automation as the first IoT camera. There were no negative Remocam reviews at the time of writing; we’ll update shortly. Oliver (my pug) and I did some extensive hands-on testing of the unit in our home. We set up an account, re-created real life scenarios, and tested each feature. We placed the unit in a central location that would allow us to see three of the most trafficked rooms in our home, and tested it both while in the home and away. One of the first things we noticed was that the app required a lot of logins and had a lot of notifications. I ended up getting about 20 or so notifications throughout the day. I reached out to Remocam directly, and they said this is something they’re actively working on, so I assume it will be fixed within the next app release or two. ***Update***: Before I was able to finish writing up this review, they updated the app to allow for automatic logins and removed notifications for secondary users logging in. This drastically reduced unnecessary notifications and logins. We were REALLY impressed with how quickly they took our feedback and turned it into an app update (about 5 days turnaround time). By far one of our favorite features of Remocam was the impressive range of motion for pan and tilt on the camera. Pan and tilt sounds like it should be a pretty basic feature, but a lot of popular Wi-Fi cams are stationary (including Nest Cam). We got a wide range of motion out of Remocam. In fact, we got more than the 335° advertised — we got about 365°. Because the range is so wide, we recommend placing the unit in a central location that can monitor multiple rooms. For our house layout, we were able to monitor three rooms instead of just one by strategically placing the Remocam. 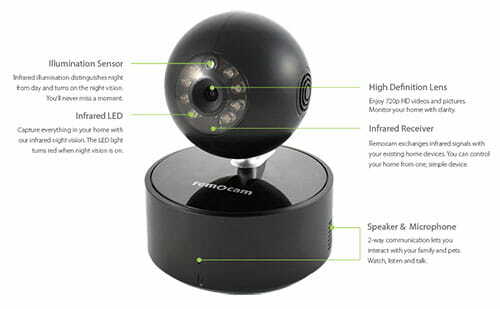 At 720p, it’s not as crisp as the Nest Cam or other 1080p HD devices, but we were still impressed with the overall quality of Remocam’s live streaming video. Below we have screenshots of the normal view, as well as of the digital zoom. For checking up on the dogs or understanding what’s going on in your house, this quality is more than acceptable, but if you need crystal-clear video for any reason, you may want to consider a different Wi-Fi camera. 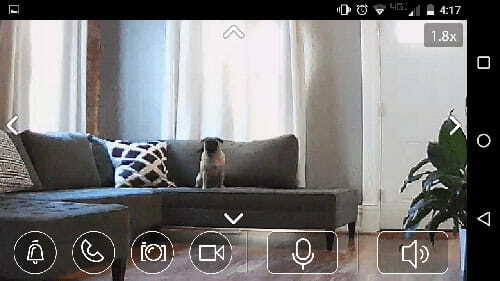 The Remocam has an internal microphone and speaker that allows you to listen to what’s going on at home and speak to an intruder (or your pug) to let them know that you know what they’re up to. The sound quality on both the speaker and the microphone was a little fuzzy, but you could still easily understand what the person on the other end was saying. We reached out to Remocam about the sound quality, and they mentioned the second generation of this product will have an improved audio chipset. If you can’t already tell, I’m a dog lover. So I appreciate the fact that Remocam baked in so many dog-friendly features. Ever since we got the Remocam, we’ve been able to stop crating Oliver during the day because we can see what he’s up to and we can speak to him if there’s an issue. This might seem like a small benefit, but to us it’s been huge. Remocam is also planning on launching a smart pet feeder in the future, and we’ll be first in line once it comes out (date TBA). One of Remocam’s selling points is that it’s the first IoT (Internet of Things) Wi-Fi Camera that offers home automation features. And although we think it’s a strong Wi-Fi camera, the home automation features fell a little short of our expectations. Their home automation feature ultimately boils down to the ability to add infrared commands to the app for TVs and other appliances with a remote. This seemed a little disingenuous to us, since they boast of the ability to turn on and off lights, but don’t clarify on site that it only applies to lights with remotes (I don’t know about you, but most of our lamps don’t come with remotes). We also ran into some logistical problems with these features. Our TV is located on the piece of furniture you see on the right by the plant in the screenshot above. Since the camera has to be pointed at the TV in order to use the remote functionality, it wouldn’t work for our home’s arrangement. We ultimately found it easier to use a physical remote or an app anyway. Now to be clear, we don’t think this takes away much from Remocam since we’d be purchasing primarily for all the features we listed above, and not home automation features, but we wanted to make sure you knew what you were getting into before you purchase, just in case you were expecting the equivalent of a full home automation system. Absolutely. 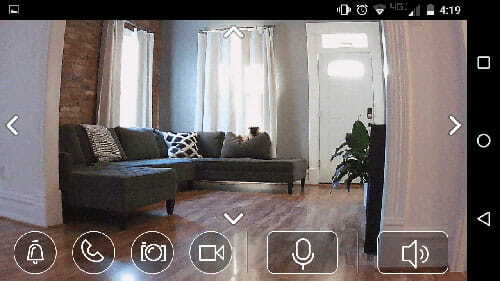 Remocam is a solid Wi-Fi camera that we’d recommend to anyone that’s looking for a little added security, streaming video, or a pet-friendly camera. We expect to see more integrated solutions with the release of their smart doorbell Remobell (later this year) and other smart devices for the home (coming 2016). Have any questions about Remocam? Leave a comment and we’ll do our best to answer your question. There are three different types of notification and recourse for home security systems, and choosing the right one can make a big difference in your peace of mind as well as what happens if an intrusion occurs. We’ve broken out each type below so you can see where Remocam fits in, and make an educated decision for your family depending on your needs. We always recommend professional monitoring. Professionally monitored systems have call centers that reach out to you or the authorities if the system is triggered. We recommend this type of monitoring because it works 24/7 regardless of your phone’s battery status, your sleeping patterns, or the movie theater’s phone call policy. You can view the professionally monitored security systems we recommend here. This is what Remocam is. Self-monitored systems notify you that the system has been triggered through text, email, or phone app notifications. This allows you to deal with alarms as they happen if you see the notification, but if you miss the notification for any reason, it’s as if you don’t have a security system. We definitely prefer this system to locally monitored systems (below), or no system at all, so if monthly monitoring plans aren’t in the budget, or you want to avoid a contract, this would be our second choice. Local systems are systems that will sound an alarm if triggered, but won’t notify you if you’re not at the location. Although sirens have proven to reduce the amount a burglar takes off with, we generally don’t recommend these because there are better ways to spend the money. Still have questions about home security systems or monitoring? As always, let us know in the comments below and we’ll do our best to answer any questions you have.